Today I bring you a classic vegetarian recipe that's been a staple in our kitchen for years. It comes from one of the all-time best vegetarian cookbooks out there: Sundays at Moosewood Restaurant. This stew is truly exotic, despite the fact that it's made from a list of totally plain-jane ingredients from the store. It's also healthy, simple to make, and contains a full complement of vitamins, minerals and fiber (and even a healthy dose of protein, as you'll see below). With only 30 minutes of prep time, plus another 35-40 total minutes of cook time, you can feed 6-8 people (or more) easily. As with most of the vegetarian soups I've featured in this blog, this recipe is laughably cheap. Correction: make that hysterically cheap. The entire pot of stew, which usually feeds the two of us for an entire week, costs about $10.00 to make. That means that on a per-serving basis, this dish is even cheaper than our Fried Rice. Once again we have further proof that cooking at home simply crushes eating out in a restaurant, both from a health and an economic standpoint. Sauté the onions and the cayenne pepper in oil for about 10 minutes. Add the garlic and sauté for a couple more minutes. Add the cabbage and sweet potatoes and sauté, covered, for a few minutes. Add the juices, ginger, cilantro and tomatoes. 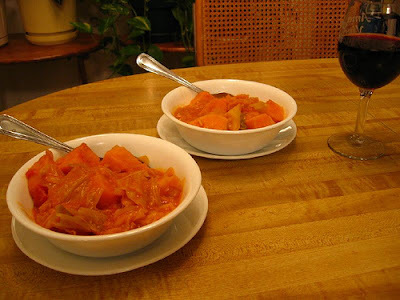 Bring to a boil, cover and simmer for 15-20 minutes or until the sweet potatoes are tender. Be sure to stir the stew occasionally to prevent it from sticking to the bottom of the pot. 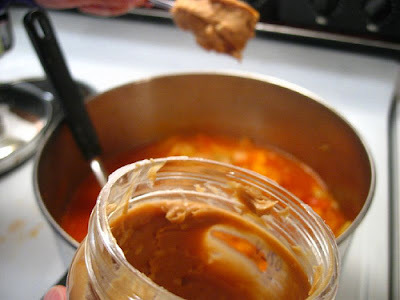 Add the peanut butter, stir thoroughly, simmer a few more minutes, and serve. If the stew gets too thick, feel free to add more tomato juice and/or apple juice. Finally, let's look at some photos of the making of this recipe. Hopefully this will help give you helpful visuals on how the dish is made. Here's the entire complement of ingredients. Note once again the seemingly extraneous bottle of beer. Readers of this blog will know that this is a critical mood-elevating agent for the chef. 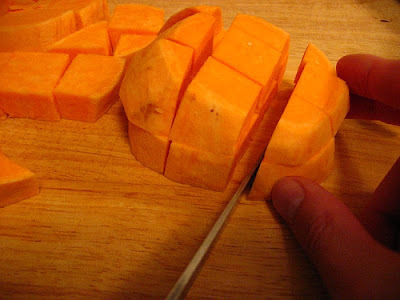 When I say the sweet potatoes should be coarsely cubed, I mean it. Don't create extra prep work for yourself. ...and then also mince some extra and throw it into the pot too. 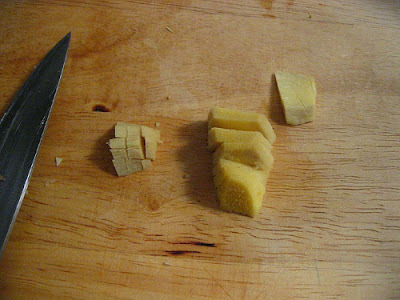 There's nothing like biting into a little suprise chunk of ginger while you're eating this stew! 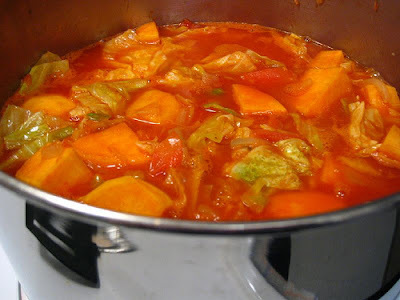 ...the stew will be a visually arresting bright orange color. For those readers interested in seeing more of the making of this recipe, I've posted the full set of photos at flickr. Okay that was AWESOME. Thank you! Hi Bethany--thanks for your comment! Pretty neat that you made it the same day I posted the recipe. :) I'm really glad you liked it! Love the pictures, Daniel! And I have to say that a bowl of this stew would be just the thing on a cold and rainy day like today! Hi Ivonne, thank you for the kind words! Looks excellent. I'll be adding it to our menu, once this week's ridiculousness is over. I'm doing an early Thanksgiving to get all the photos I need for the site. Hi Heather--thanks for stopping by. Be sure to tell me how it comes out! This sounds like a neat recipe. Can I use natural peanut butter (just peanuts)? I couldn't tell from the package what kind of peanut butter it was and I know, at least in baking, that natural peanut butter can kind of screw up a recipe. 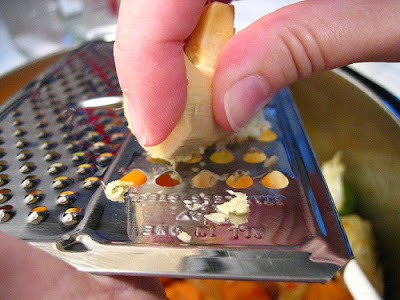 Hi Craftevangelist: nope, it shouldn't matter at all what kind of peanut butter you use, whether natural, smooth, chunky, with or without "emulsufiers" or organic/natural. My kind of recipe. Good luck and let me know how it comes out if you make it! Oh, my. This is amazing! A really bizarre mix of flavors that just works. I added probably 3/4 a cup of apple juice and a little more peanut butter to dull down the tomato juice taste. I also used red cabbage instead (because I'll eat the other half of the head I didn't use in the stew before it goes bad but probably wouldn't have eaten the leftover green)--it made it even prettier! I did serve it over rice to make it a fuller meal. Brittany, so happy you had success with this recipe. It is a home run, isn't it? Interesting variation to use red cabbage, too. I'll have to try that. Thank you for sharing your feedback! Daniel, want to make this but DH *hates* PB (I know, whyever did I marry him???). Any substitution suggestions? Or is the PB taste not that noticeable? Also, I heart the Yuengling in the background. As an eastern PA who has been dumped into the wilds of western OH, it's a sight for sore eyes! Emmy, it's a background taste, not a dominant taste. It blends in with the stew such that the sum of flavors is more than the individual component parts. I hope that helps. If you are really tempted by this recipe, I'd just try it (and maybe go a little easy on the PB the first time) and see if your husband likes it too. I'm betting he will. Oh. My. Goodness. Gracious. I think I burned my tongue, licking the sides of the pot! Daniel, you are the MAN! Had a chance to try out this recipe yesterday. I have to admit, it turned out real yummy. Tweaked the recipe just a bit..as I didn't had few item readily. Replaced tomato juice with 1+1/2 cup of tomato sauce and water. Replaced apple juice with bouillon and 1 tbsp of honey. To kick it up added cumin and sriracha sauce. Awesome soup. Thanks for the recipe. I posted a shot of the soup in my photo blog. Thank you! I'm always happy to hear that another satisfied customer made and enjoyed this recipe. It's truly a world class mix of flavors and tastes. I finally got around to trying this recipe and loved it! Just wanted to share our modifications for curious readers. I made this in the slow cooker, which worked just fine. I 'sauteed' (OK, I used the microwave) the onions, garlic, and ginger in olive oil before putting it in the pot and then threw everything else in on top and cooked on low for a few hours. My husband hates stewed tomatoes, so we left the chopped tomatoes out, and it was fine without them, although I did use the tomato juice. Finally, if you're fans of spicy food, Peanut Butter and Company makes a spicy peanut butter that was amazing in this. But be warned-- it came out REALLY spicy. you could go half spicy/half regular if you want a little spice. Hope that's helpful to someone, and thanks for the great recipe! No... not really. 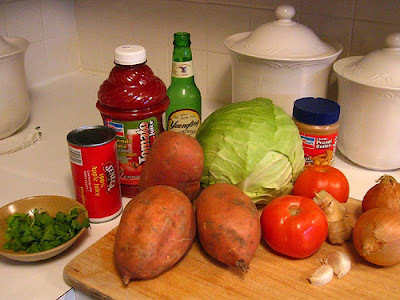 The sweet potatoes will most likely get mushy, so the texture of the soup will suffer. This is a better recipe to eat fresh. Hope that helps.